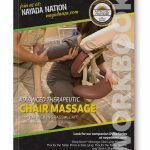 Give your clients the ultimate in therapeutic massage with Nayada’s Side-Lying Massage Workbook. Side-lying movements aren’t just for pregnancy massage–they offer a host of benefits for your clients, allowing you to work on otherwise inaccessible areas of the body. And when you use Nayada’s unique BodySaver Method, the massages you offer will benefit you too! This workbook easy-to-follow demonstrations for both fully-clothed and draped techniques, allowing you to use the technique best suited to each individual. … and much more! Bring the classroom to your living room with Side-Lying Massage, and grow your career today!